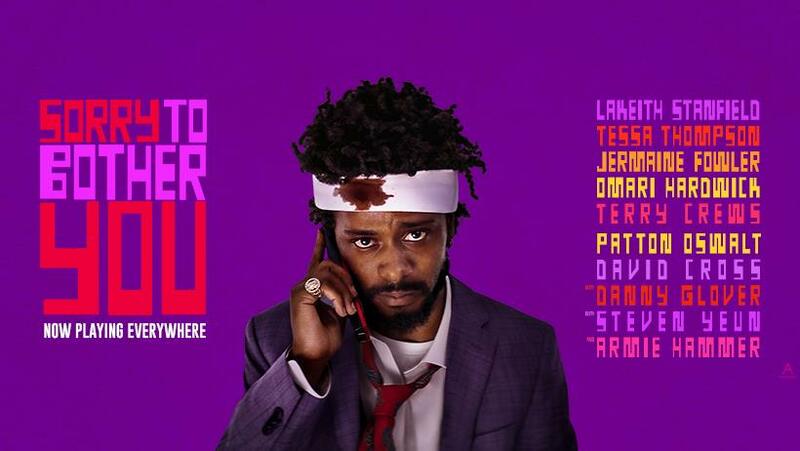 New York, NY – Heads up, the most entertaining, provocative and overtly pro-union movie you’ve probably ever seen on the big screen has just gone into wide release, and it’s writer/director Boots Riley’s Sorry To Bother You. Sorry To Bother You: A Must See For Trade Unionists Everywhere. Outside of a small collection of some outstanding documentaries, (Harlan County USA, At The River I Sand, Still The Enemy Within) the list of top-notch theatrical offerings centering on aspects of the Trade Unionist Movement are pretty damned skimpy, considering how “liberal” Hollywood is purported to be. You’ve got Norma Rae (1979), Matewan (1987), and….well, I dunno. When the best Google can come up with is Sylvester Stallone’s F.I.S.T. (1978), you quickly begin to realize just how refreshing — and revolutionary — Sorry To Bother You’s arrival in U.S. theaters actually is. The movie — tracking good guy telemarketer Cassius Green’s (Lakeith Standfield) heroic attempts to survive a hallucinogenic milieu of surrealistic Americana — nevertheless, deals with a spate of societal ills that are all-too real. Chief among them: racism, classism, commercialism and economic inequity. Tackling each of these heady issues with the same cutting comedic wit that distinguishes his powerfully subversive music (Riley’s riotously rebellious hip hop outfit The Coup has been churning out inventive tracks since the 90’s), Sorry To Bother You is unequivocal about the power of collective action to beat the right-wing wrongs shot through the U.S. economy. Sorry To Bother You is replete with lots of mind-blowing imagery — not the least of which, however, is the sight of Cassius and his exploited co-workers, in unison, slamming down their telemarking telephones and standing up for workplace justice. In addition to being a force of talented creativity, Riley is also an astute student of the Organized Labor Movement in this country. When the evil corporation depicted in Sorry To Bother You ultimately resorts to brute force and naked violence to squash the rebellious telemarketers, he is directly referencing all the defiant trade unionists of the past who had their skulls cracked and necks snapped fighting to secure the rights so many of us take for granted today. Further, in dramatizing the resolute telemarketers standing together and holding the line against a phalanx of jack-booted corporate thugs intent on crushing their righteous uprising, Riley is clearly suggesting that similar sacrifices will have to be made yet again. As cognizant of Labor history as it is, the remedy that Sorry To Bother You offers working men and women struggling under the yolk of 21st Century American oppression, is also forward-looking and enlightened. Cassius’ multi-cultural co-workers ultimately triumph over the bosses, not only by hanging tough and sticking together, but by reaching out and forming powerful alliances with allies simpatico with the working class’ plight. Riley’s protagonist is no porcelain proletariat — he is a flawed and fragile human being who succumbs, stumbles and sells out. And yet, inside Sorry To Bother You’s mad vortex of corporate complexity and lies, Cassius still manages to pick himself up and regain his bearings once more. Another important lesson for aspiring revolutionaries everywhere. In the finest tradition of Zen teaching, Sorry To Bother You reaches for absurdist exaggeration to drive home its point; in this case, the true aims of the unholy and undemocratic oligarchs running the show. But it’s just one more reason you’ll be talking about this movie long after the house lights come up. SPIRIT OF THE LAW: Have Google, Apple, McDonald’s, Disney and Others Illegally Suppressed Workers’ Wages?